First in a series of works which outlines a complete system of homeopathic medicine including an extensive, evolving classification by homeopathic family and detailed clinical information on over 600 remedies, Praxis Volumes I & II presents the most complete methodology in homeopathic medicine since the publication of Hahnemann's Organon of the Medical Art. Building on Hahnemannian principles, Mangialavori offers a new approach to homeopathic epistemology, literature, research, case-taking and analysis. Primary foci include the structure and strategy of both the patient and the substance from which the remedy is made; the search for coherent themes and their hierarchical organisation; the association of remedies through homeopathic rather than taxonomic families; and the reliance upon strict scientific criteria - primarily case studies as opposed to provings - for validation and elaboration of a remedy's core features. The method incorporates concepts from various disciplines in the humanities and the natural and social sciences, most notably, complexity theory, autopoesis and psychoanalysis. Praxis Volume I explains Mangialavori's methodology in detail; Volume II (in three parts) serves as a materia medica of the homeopathic Drug family while also providing case examples of how the method is applied. Volume II Part I covers the remedies Agaricus muscarius, Anhalonium lewinii, Bovista lycoperdon, Convolvulus duartinus, Nabalus serpentaria and Psilocybe caerulescens. Praxis is the first in a series of works which will outline a complete system of homeopathic medicine including an extensive, evolving classification by homeopathic family and detailed clinical information on over 600 remedies." Every serious practitioner, whether novice or experienced, should read and deeply ponder Massimo Mangialavori's long-awaited "Praxis". If Samuel Hahnemann was the Renaissance medical thinker of his age when he brought out the foundation-creating "Organon", Massimo (as he is com­monly known) is the counterpart of this age. Homeopathy is a science grounded in solid principles that progressed beyond even those of modern sciences like chemistry or physics or pathophysiology. Nevertheless, science itself has evolved into new realms - consider modern psychology or anthropology or even quantum mechanics and cosmology. Inspired by the spirit of Hahnemannian inquiry, modern homeopathy em­braces all these fields as we deepen our understanding of remedies, families, and patients. Massimo has always had a deep appreciation for philosophy and medical anthropology and has been further expanded by epistemology, modern psychology, and computer tools, as well as creative and practical use of analogical thinking. In Praxis, he sys­tematically and thoughtfully examines the foundations of homeopathic methodology, praising its strengths and challenging its flaws. Finally he presents principles and criteria for creating the methodology of the future. Each paragraph and each sen­tence are laden with profound thinking and deserve the same meditative approach for readers that we applied to the Organon. In early chapters, Massimo considers in de­tail the bases of our science in provings, repertories, and the use of rubrics. He val­ues the genius of Hahnemann's contribu­tion in his time but points to the value of computers in helping us analyze cases much more effectively if we simultaneously appreciate the limitations of rubrics over the lively and dynamic descriptions offered by patients. In discussing remedies, the starting percep­tion is that every substance has a "strategy" of being in the world that is unique to it, has identifiable themes discoverable through cured cases, and even has some aspects shared by others in the same family. He de­velops this concept in a profound way. Moreover, Massimo elucidates how we can use this perspective to discover the "strat­egy" of remedies not yet known or fully fleshed out. We can use information from medical anthropology, historical uses, toxi­cology, etc., in the same way Hahnemann did but with broader focus. Massimo then launches into the value of Families, how some polychrest images are archetypes of themes that can be seen in more detail in many other remedies. He defines different types of themes that I believe will become common distinctions we will make in our case analyses as our profession gains in sophistication. An emphasis I personally value are the sec­tions on case-taking. Massimo makes an important point of creating a "therapeutic field" in which the deepest experiences of the patient can be expressed. It is clear he is not merely cataloguing keynotes or ru­brics but rather discerning the deeper inner story or "strategy". Massimo makes a very important point when he sets criteria for what we as a profession need as a standard for the threshold of believing we have a true image of a remedy. Length of time of cure is significant, of course, but he very soundly insists that we should also have cured cases of both gen­ders, adults as well as children, and even animals in order to be complete. These cri­teria escape the trap we often find our­selves in by carrying a stereotype that views a remedy as "male" or "female", or not including its evolution from childhood. Chapter Seven in Volume I is a truly ground-breaking chapter that renders modern psychology relevant to homeopa­thy. We all use these principles in practice at least casually. Massimo goes further by illustrating how these basic truths can be defined concisely and then applied to our understanding of the dynamic in each pa­tient, as well as how this relates to remedy types. By being more precise and careful in our evaluations of patients, we gain better insights and make deeper prescriptions. The entire presentation Massimo calls the "Method of Complexity". His perspective on this is very useful to us. Homeopathy is not a matter of matching data points or even keynotes - or even mere patterns. It is a matter of grasping dynamic processes that are completely true to life. This com­plexity is not so difficult or abstract as to be unreachable with reliability. There are principles that can be understood and fol­lowed, and Massimo does a brilliant job of making this clear. If we had only Volume I, we could easily end up saying, "This is all well and good intellectually, but I need something practi­cal." Volume II is the answer to that. It is purely clinical and illustrates principles de­scribed in Volume I. Moreover, it illustrates part of the fascinating family of drug remedies. The cured cases illustrate in depth the full subtlety of Anhalonium lewinii, Psilocybe caerulescens, Agaricus muscarius, Bovista lycoperdon, Convolvulus duartinus, and Nabalus serpenteria. In doing so, he shows how Family themes can be differen­tiated from individual themes. They also il­lustrate tellingly the value of modern psy­chological thinking in understanding rem­edies. In summary, these books deserve full and contemplative attention. As practitioners, we need a solid foundation of thinking to keep us grounded in consistent and reliable results. Praxis provides that foundation. Massimo Mangialavori's latest work is valu­able medicine for all homeopaths. Simply reviewing it has already enriched and sharpened my practice. It is written percep­tively, with careful attention to detail, and requires a comparable intelligence on the part of the reader. Most of all, it is a philoso­phy, beginning with the basics, and reshap­ing them according to the needs of our own time, in a way that makes logical and prac­tical sense. 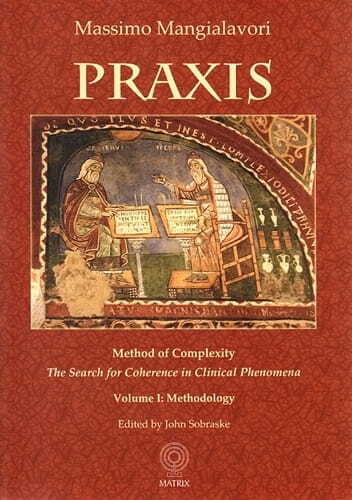 Its subtitle, "The Search for Coherence in Clinical Phenomena", provides its guiding purpose: to find a deeper, more meaningful similitude between remedy and patient than any list of unrelated symptoms in a Repertory, such that its various symptom-elements fit into and are derived from a co­herent whole, like the "essence" that Kent and Vithoulkas sought, and that Scholten and Sankaran are now seeking. It is Massi­mo's way of discovering that unity, and of describing and understanding it once found, that is uniquely his own. His "Method of Complexity" is so named because it includes anthropology and folk medicine, physiology, biochemistry, toxi­cology, classical homeopathy, and the art of clinical medicine, which ties them all to­gether and arises from acquaintance with human nature more than book learning. Massimo differs from other teachers chiefly in this multisystems approach, his quest for resonance and corroboration on so many levels, and his insistence that no one meth­od of case-taking or remedy study will work every time, that homeopathy is an art to be experienced anew with every case, and is never complete. His first great heresy is that provings are not the best source for materia medica study, because they yield vast amounts of information, in long lists of detailed symp­toms, whereas the student mainly needs to know how important each one is for prescribing the remedy. Reliable information adequate for prescribing thus requires a system for organizing and prioritizing the data. Massimo prefers cured cases, because they alone provide richness and context that allow us to see the whole of the reme­dy in the whole of the patient, to connect the threads that led him to prescribe it, and to grasp the analogy with other pa­tients needing the same remedy. These connections he calls "themes," and from them he builds his materia medica. Themes emerging from cured cases also provide the ideal framework for organizing the proving data, which can then be used in turn to confirm, refute, or modify the themes. Materia medica study is thus an ongoing process of integration, not a rote memory exercise. The end result of this process is a rewriting and reorganizing of the Repertory itself on such thematic grounds, a monumental task that will require the collaborative efforts of a whole generation of dedicated homeopaths. "Characteristic" themes are distinctive of the remedy and often present, but not al­ways, because they are limited to certain stages in its evolution, like acute inflamma­tion for Belladonna, which is typical of childhood, or to polar opposites, depending on whether the patient is in a compensated or decompensated state. "Fundamental" themes, on the other hand, are essential structural components that must be present, although not always so easy to spot, and provide the basic source of its similitude. Thus the theme of "Isolation" in Camphora turns out to be fundamental to all the "Drug" remedies, whereas "Sensitiv­ity to cold," its famous keynote, is characteristic of only its most decompensated cases, so that a more typical compensated patient might actually defy the cold. This kind of nitty-gritty scholarship is every­where on display, and is a thing of beauty. His concept of the Homeopathic Family is uniquely his own. Scholten and Sankaran identify remedy "families" taxonomically, whereas Massimo's approach, based on shared fundamental themes, typically be­gins with a polychrest as the best-known remedy of a biological or chemical grouping, like Lachesis for the snakes, and identifies common themes in others taxonomically related to it. But eventually it adds other remedies with the same themes from out­side the group, often "small" and unfamiliar, and underrepresented in the literature. In Volume II, I marvel at how he gets his patients to confide in him as they do. The Method of Complexity aims to identify the patient's adaptive strategies, in physical symptoms no less than mental, so that the distinction between them evaporates. The idea is to encourage a free-flowing narrative, by tolerating the silences, trusting patients to tell what they have to tell, without trying to force them in a certain direction, and finding the themes wherever they lead, rather than by amassing as much data as possible. The cases are beautifully presented, and are gems of materia medica writing. Each remedy is introduced with a scholarly essay on natural history, folk medicine, pharmacology, toxicology, and homeopathic characteristics, so the narratives simply add concrete detail and give it form and shape. Many conclude with commentary by Dr. Giovanni Marotta, Massimo's long-time mentor, collaborator, and friend, almost an alter ego, whose more reflective style is nevertheless so perfectly attuned to the method which they created and developed together, that to it adds further richness and in no way detracts or distracts from the whole. I have no doubt that this work will change how homeopathy is taught and practised, both now and in future.